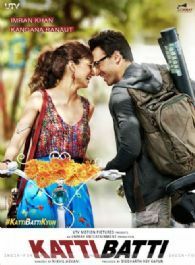 Katti Batti is an anti-love story starring Imran Khan as Madhav Kabra (Maddy) & Kangana Ranaut as Payal. Maddy is an architect who is love with Payal because of her attitude towards life. Imran Khan RETURNS to the world of Bollywood but with a TWIST! Post break up, Richa Chadda found herself a New love! Kangana Ranaut proves her detractors wrong! 10 Actors who disappointed Bollywood in 2015!